I've been living the triathlon lifestyle for almost five years now. (For the record, that blows my mind. I still feel like a newbie in so many ways.) While I can say that living this lifestyle has MANY benefits including great friends, increased confidence and a smaller waistline, there is one thing that just really irks me - the havoc that chlorine has on my nails. 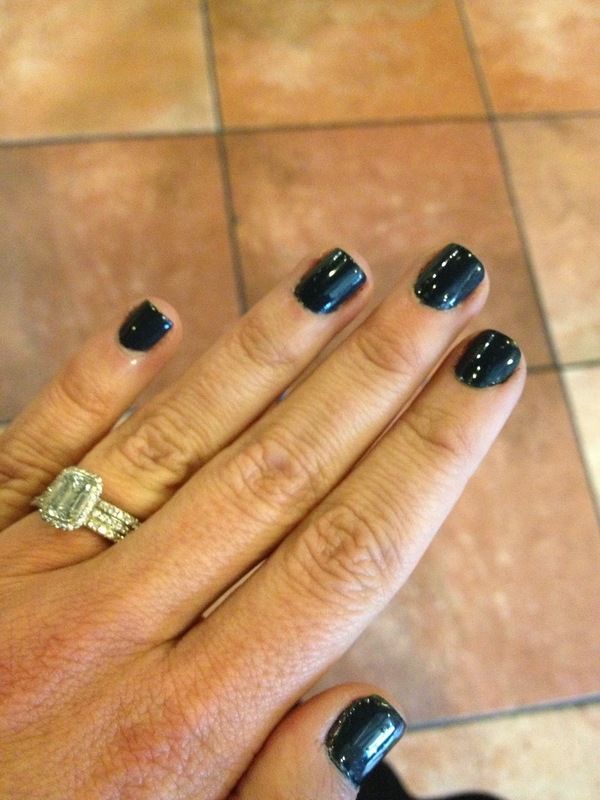 While I guess I've always been somewhat of a tomboy (raced BMX, studied karate), I've also always liked having my nails done. 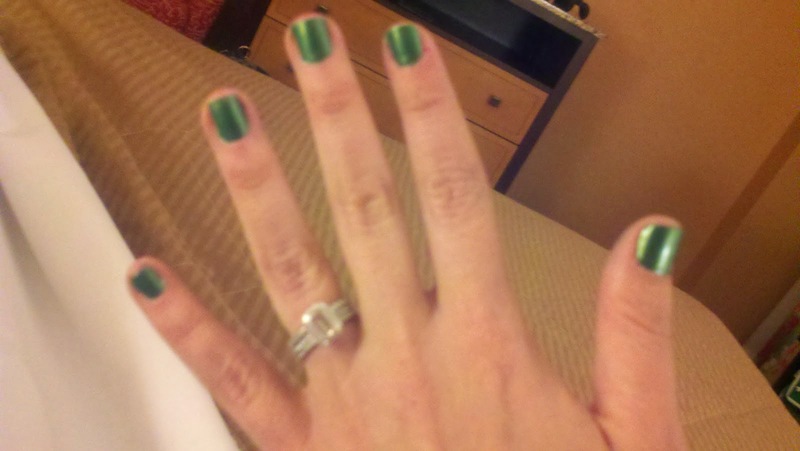 In fact, I frequently paint my nails to match whatever race I'm doing. Nike Women's Half racing for Team in Training. Rocking the Ironman Chattanooga colors. Alas, since I started racing tris, my nails are naked most of the time. There really doesn't seem to be any point to painting them because chlorine just eats my polish during every swim. And then my nails look terrible, and unfortunately, there isn't any amount of retouching that can be done to make them look decent again. They'll just look lumpy and gross. 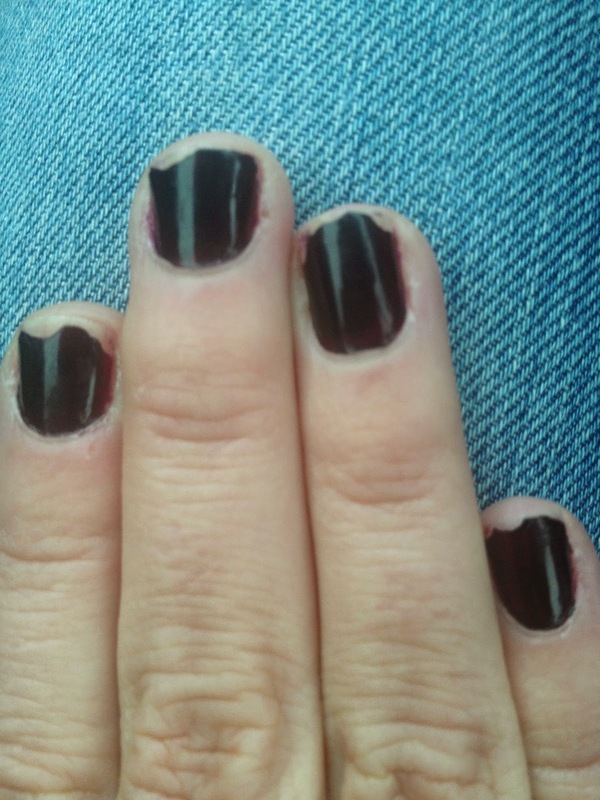 So, I have to remove all of the polish and reapply it again. And I don't have time for that, considering I swim several times a week. UGH. Nails post-swim. Stupid chlorine. Not much of a difference, huh? 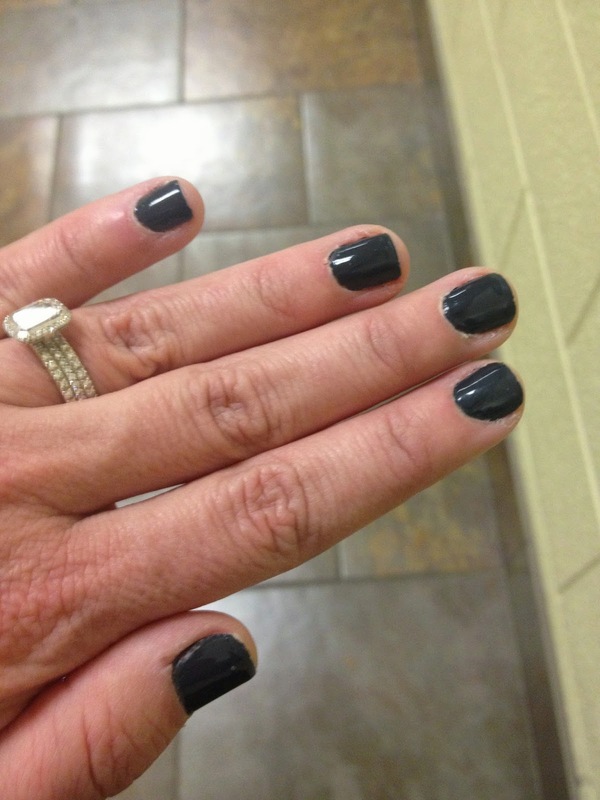 And a HUGE improvement from what my manicures used to look like after swimming. On the above manicure, I painted my nails on Sunday, and removed the polish on Thursday night when it finally started to chip. That's a five-day run with two swims thrown in. 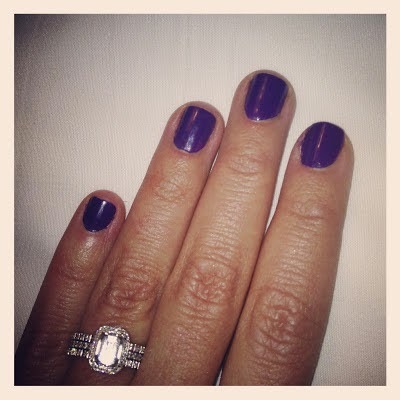 Not bad for an at-home manicure. And the best news of all is the Gelous isn't crazy expensive. 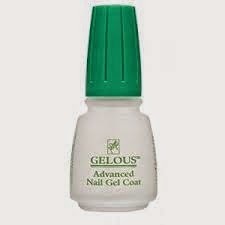 I think I paid $7 for it at Sally Beauty Supply. That's a heck of a lot less than most polishes, and WAY cheaper than a professional manicure. I wonder if Gelous has any interest in entering the tri world. It's probably an untapped market for the nail industry. I could TOTALLY be an ambassador for them. Just give me some free samples and a t-shirt and I'd good to go. Gelous - if you're reading this, drop me a line. We should talk. 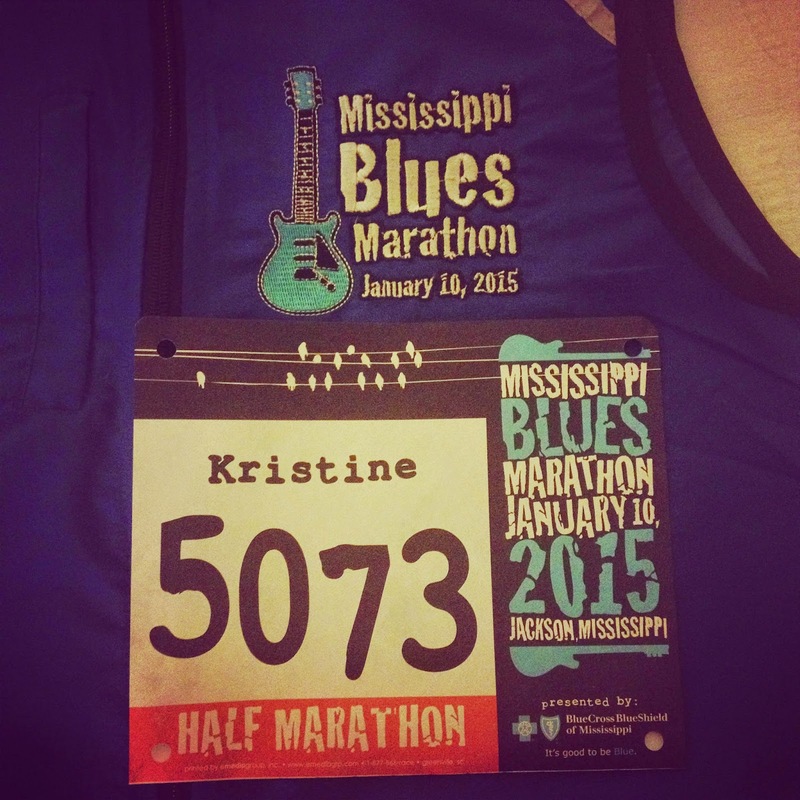 This past weekend, Dudley and I headed down to Jackson, MS for the Mississippi Blues Half Marathon. Jackson is about a six hour drive from Nashville. It's not a bad drive, but definitely about my limit for a weekend race. 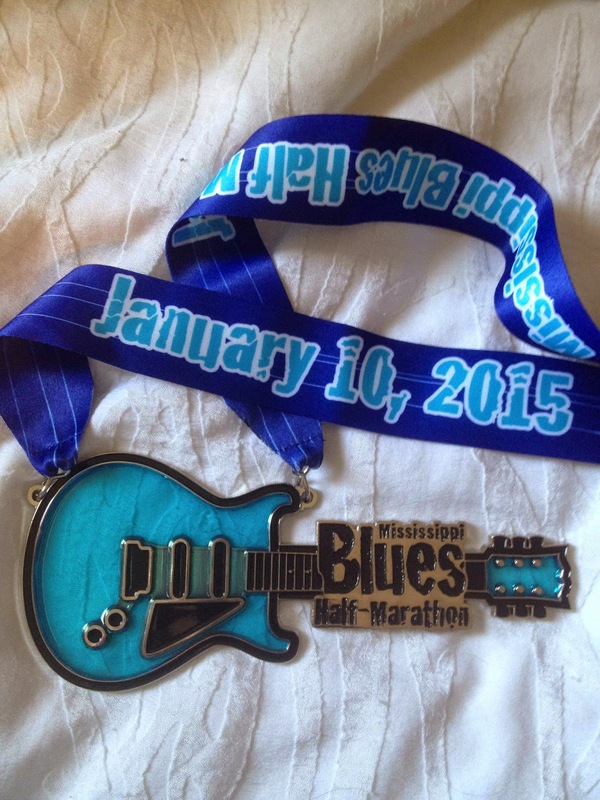 The Mississippi Blues Half has been on my radar for about two years. I've heard great things about it, and it has actually been named one of the races "to do" by Runner's World. It's also supposed to have great swag. Not that I would do a race just for the swag...but it helps. THEN I noticed how nice everyone was. Seriously. Smiling faces everywhere and all of the volunteers were so helpful. Check in went very quickly without any issues (well except that I thought I lost my phone charger and spent about 20 minutes looking for it, only to find it in the car. Sigh.) 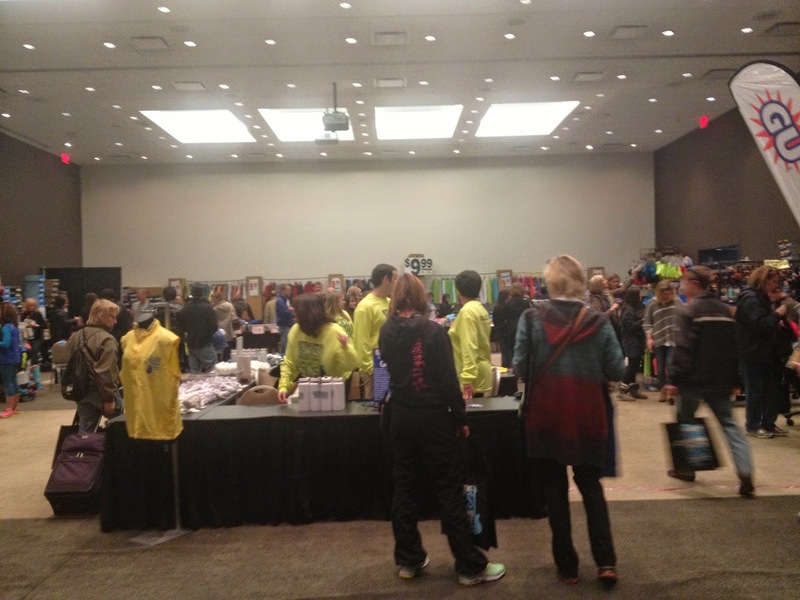 Being that I had heard so much about this race, I was surprised at how small the expo was. Not that anything was lacking, but it just surprised me. However, considering there were only about 4,000 people running, it was actually the perfect size. Along with the standard expo vendors of race organizers and running supplies, there was also a blues band playing (of course). I love themed races. After the expo, we checked into our hotel, which was about a 1/2 mile from the Convention Center. It seems that Jackson is going through a bit of urban revitalization. We stayed at the Hilton Garden Inn, which had been recently been renovated after sitting vacant for a few years (so I was told). While our hotel was very nice, the rest of the block looked like something out of the zombie apocalypse. I'm not joking. Same street as our hotel - less than a block away. Fortunately, there was some road work being done, and new sidewalks poured in areas, so it looks like there is some development going on. This could really be a neat area if it's developed properly. Jackson has some cool architecture. 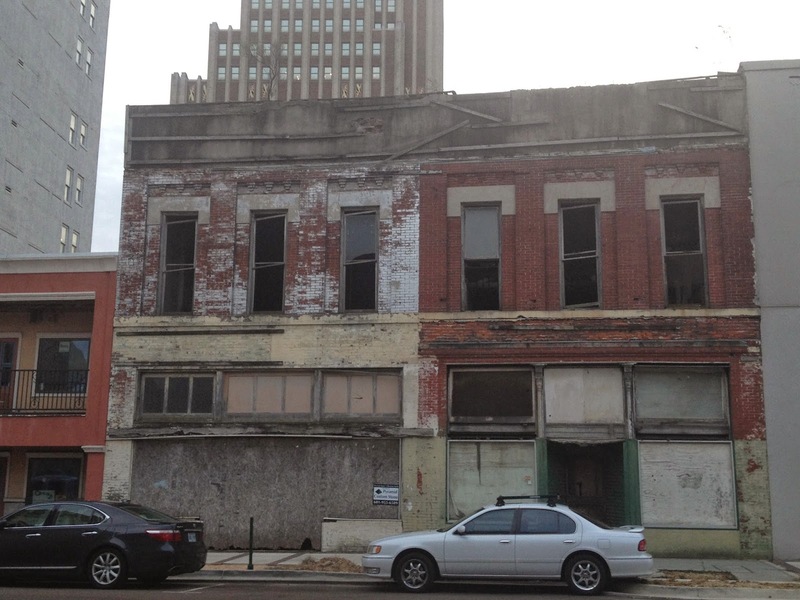 Hopefully, they'll renovate the historic buildings (such as our hotel), rather than tearing everything down like Nashville is doing. 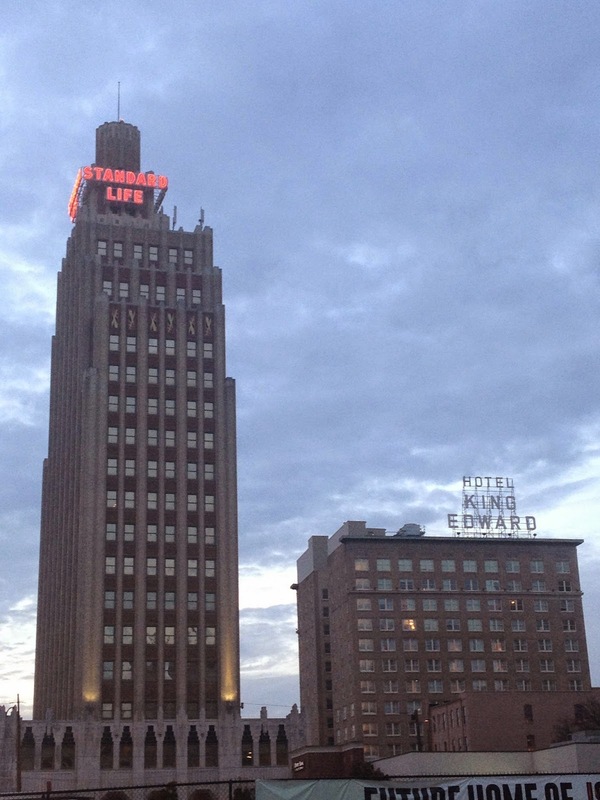 Our hotel is on the right - the former Hotel King Edward. Dudley and I did a little walking around, but there wasn't a whole lot of sightseeing to be had, so we went back to the hotel. Funny story - we started talking to another couple (in town for the race) in the elevator about the area and where we could eat dinner. The conversation continued as they arrived at their floor and stepped out. As the man was stating "One area we were warned not to go is...", the door shut. WHAT?! This sounds like information that we NEEDED to know. Fortunately, we happened to find the couple in the lobby a little later on and get the rest of the sentence. They warned us not to walk under some unlit railroad tracks. Uh - yeah. Don't worry about that. Wasn't planning on doing that anyway. By nighttime, it was crazy cold and my sweet husband volunteered to go to a local restaurant, the Iron Horse, to pick up dinner. Perfect. I didn't really pack for weather in the teens, so I was all for staying in the warm hotel room. 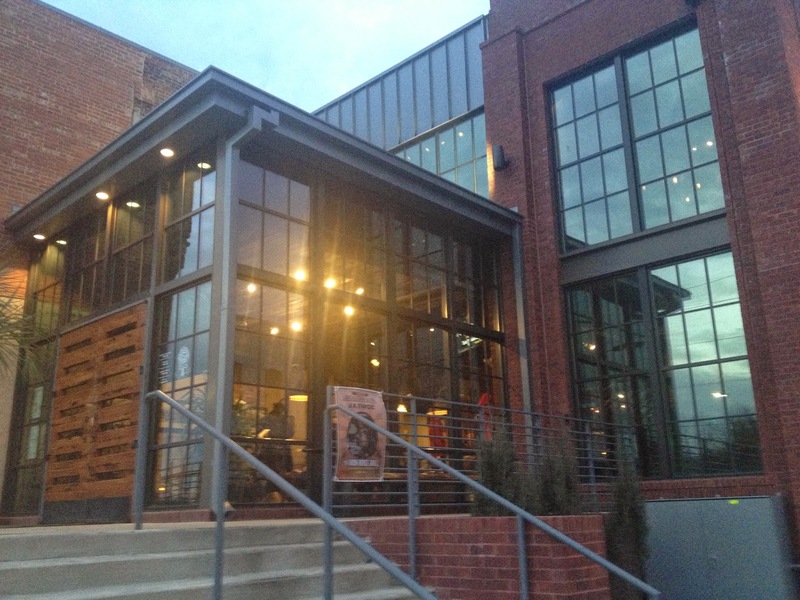 We walked by the Iron Horse earlier and checked out the menu. It's probably one of the nicer places in downtown Jackson. It was good, too. If you're ever there, you should check it out. Since the race was at 7:00 AM, we pretty much went straight to bed after dinner. Those 5:00 am wakeup calls are never any fun. What was even worse was the TRAIN that went by at 4:00 am. 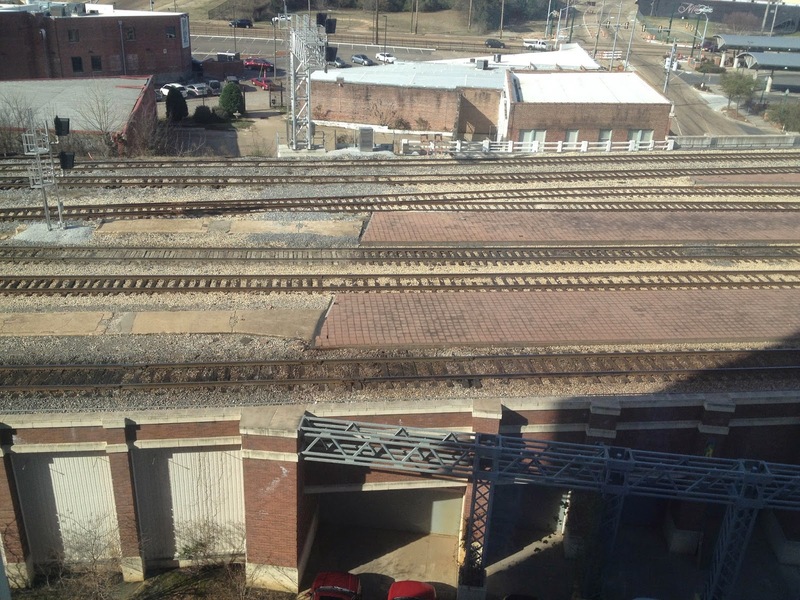 Remember those railroad tracks I mentioned previously? Yeah - those were literally outside of our hotel window. That train woke me right up. Never went back to sleep either. From our window. Hello, Tracks! Race morning was mainly spent trying to figure out what to wear. It was currently in the low 20's with a wind chill in the teens. But you warm up quickly when running 13 miles, and I didn't want to over heat. I went with running tights, two shirts (short and long), a hat and gloves. I knew I'd be cold at the start, but really didn't want to have to deal with a running jacket since I knew I'd probably want to take it off. We walked down to the start around 6:30. Though I didn't know exactly where the start was, I knew it was by the Convention Center, so we started walking that direction. Before too long we heard, you guessed it, blues music, and knew we were in the right place. The race was too small to have corrals, so we tried to find the 2:00 Half pacer. Again, my plan was to run with the pacer and just see how I did. While my goal was to go sub-2:00 (and so was Dudley's), I'd be happy with breaking my PR of 2:04. It just depended on how hilly the course was. Unfortunately, we never found the 2:00 pacer. Fortunately, we both have Garmins, so it wasn't a big deal. After a very bluesy guitar rendition of the National Anthem (I have no idea how he was able to play because it was SO COLD), we were off. While I would love to give you a detailed account of the race course, I can't. I was so focused on warming up and my pace that I have no idea what the course looked like. It was pretty urban for the most part though. We started downtown, ran a few miles and looped back though town before heading out the other way. From there we kind of went by a highway and actually might have run up an overpass. I don't really know. My mind was numb by this point. There was some great support on the course, and the volunteers were fantastic - especially since it was so stinking cold. It was hillier than I expected - mostly rolling for the first part, but the hills really kicked in around miles 8-11. Thankfully, miles 12 to the end were pretty flat, if not downhill. Always a blessing. As far as my race went, it was great. My racing superpower is that I'm consistent and don't have wild fluctuations in pace. I might slow down because of a hill or something, but once I get a pace locked in, I'm pretty much on autopilot. Since I didn't have a pacer, I tried to maintain a 9:00 pace. That's a little fast for a sub-2:00 Half, but I wanted to give myself a time buffer in case of hills. This strategy went really well. While I was definitely working, I never felt like I was overexerting myself. In an effort to not jinx myself, I only looked at my lap pace (pace at the end of each mile) and distance on my Garmin. This was really helpful because I was forced to focus on the mile I was on, rather than my race as a whole. 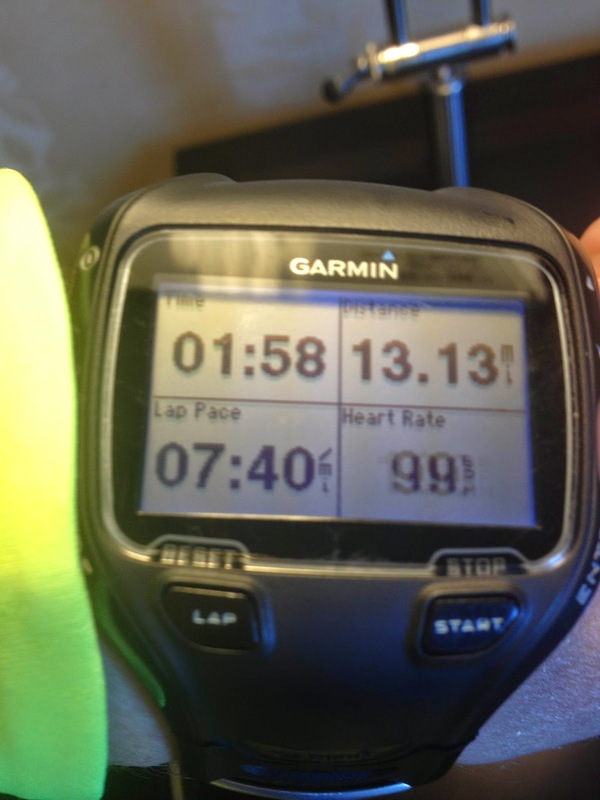 It was like I was racing 13 one-mile races rather than a half marathon. With a quarter mile to go, I finally allowed myself to look at my overall time: 1:56. I had four minutes to run a quarter mile. HAZZAH! I knew I could do that! I was REALLY happy while running that final stretch. I was also wondering where Dudley was. Since we were both trying to run sub-2:00, I was hoping we'd run together. However, we got separated at an early water stop and I hadn't seen him since. I was hoping he was having a good race. Though that last quarter mile took forever, I finally crossed the finish line. Official time: 1:58:54. But here's the fun part. I had just crossed over the line when I received a giant bear hug from behind and a yell of "We did it!" I was a bit confused for a second before realizing it was Dudley. Apparently, he had been running behind me on the final stretch coming into the finish line and I had no idea. NO IDEA! How funny is that? We literally finished with the exact same time. What are the chances of that happening? This was a fantastic race and I absolutely recommend it. I can see why it's on the bucket list for so many runners. I just wish it had been a little warmer so we could have enjoyed the festivities a little bit more. And - the swag was pretty cool, too. Where else are you going to get a harmonica in your swag bag? Of course, the kicker is now is that I have to figure out what my next running goal is. My goal for the season was sub 2:00 and I hit it on my first race of the year! Do I go for 1:55? 1:50? We'll see. I still want to run a full marathon this season. That might be the next big goal. Right now I'm just enjoying my PR AND that I've added another state to my list!! Yes, I know we're already eight days into 2015, but I've finally come up with some goals for this year. Better late than never, right? Goal 1. Run a sub 2:00 half marathon. Yes, this has been my goal for several years, but silly things like Ironman Chattanooga keep getting in the way. So, I'm back on it. My current PR is 2:04. That's a long way to go, but I'm going to try to keep chipping away at it until I get there. Goal 2. Run a stand-alone marathon. The only marathon I've run was part of IMCHOO. I'd like to do one without the swimming and biking before it. But I want it to be a BIG marathon. New York or Chicago - something like that. Goal 3. Read 52 books. I've done this for the past two years and it will continue to be an on-going goal. What can I say? I love to read. Goal 4. Take a cooking class. My husband does most of the cooking and I'd like to change that. But I not only to do more cooking, I'd like to enjoy cooking. I'm hoping a cooking class will help. Goal 5. Leave the country. Or, at least take a "big" vacation. It doesn't have to be a big European tour, but I want to travel more. So, that's it. I'm also planning on knocking off a few more states from my 50 state challenge. 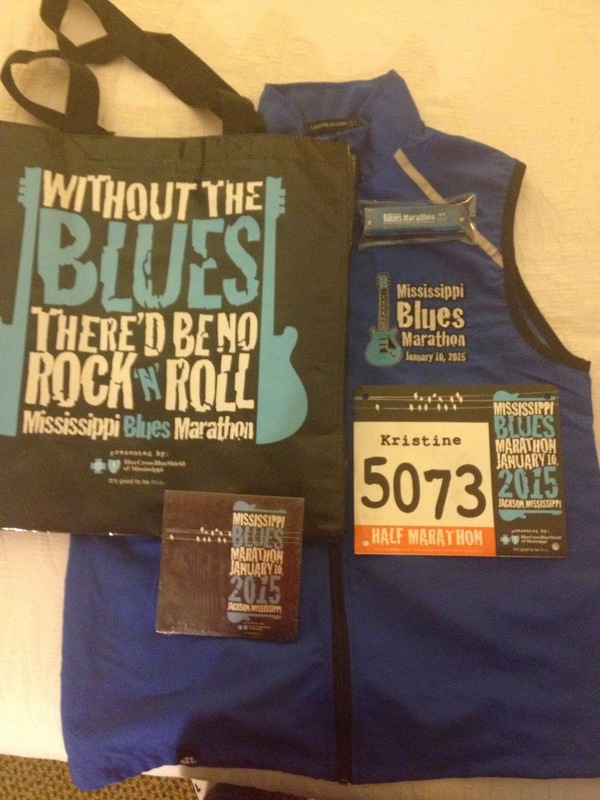 I'm heading down to Mississippi tomorrow for the Mississippi Blues Half. Only 38 more to go!! For the past several years, Dudley and I have registered for a Resolution Run on New Year's Day. Just a fun 5k to start the year off on the right foot (pun intended). This year, however, we changed things up a bit. 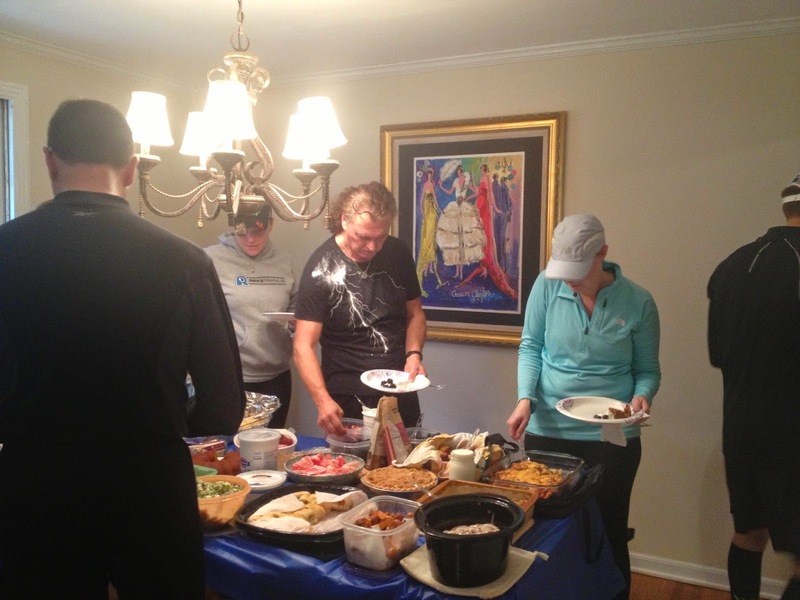 Rather than going to an official race, we hosted the 1st Annual Hangover 5k and Brunch at our new house. And it was awesome! This all went down because Dudley and I didn't know what New Year's race to do, so I started asking around as to what races everyone else was doing. My friend Kim (aka The Blonde Mule) suggested that we could just run around the neighborhood (she lives close). That worked for me as this way we could set a start time that was a little civilized than some of the 8:00 am race starts. So I threw it out on Facebook to see if anyone would be interested in a New Year's 5k / Brunch at my house. Turns out, people were. So I ran with it and BAM - the Hangover 5k was created. The Brunch part was potluck. Everyone showed up around 10:00 am and dropped off their food. We (about 25 of us) started running about 10:15. The route was a simple out and back down our street, but it's got a little bit of everything - rolling hills, a bit of flat and a long, grinding hill at the end. It was a hoot to watch everyone take off from our house. I really wish I would have gotten a picture / video of it. Oops. While we told our immediate neighbors about the run, I'm sure other neighbors were like "WHY are all of these people running down my street?" By 11:00 we were all back and eating. And did we have the FOOD! So much food! 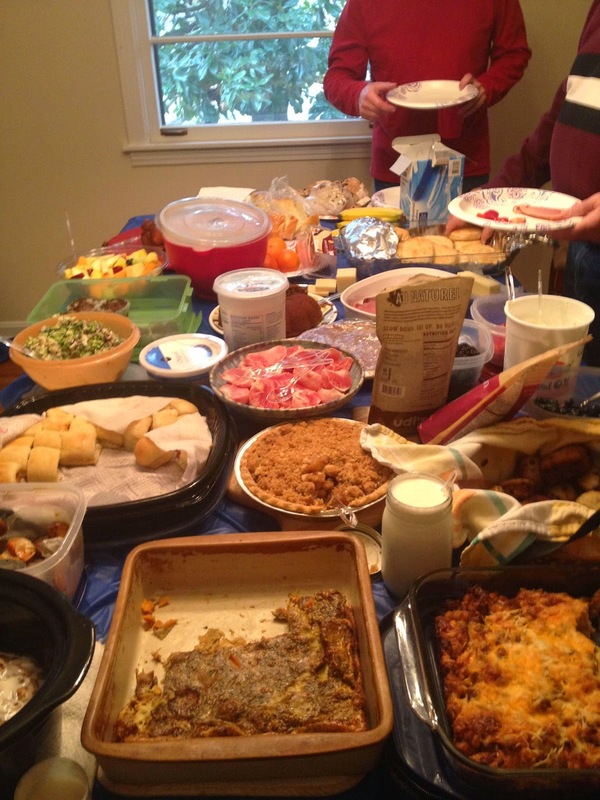 Fruit, biscuits, egg casseroles, tamales, ham, monkey bread... I could go on. We had fixin's for Mimosas and Bloody Marys as well, though most stuck to coffee, water and juice. This was just part of the food. Dudley and I really enjoyed opening up our home to our friends. We were unable to entertain in our previous home due to parking restraints, but this home is perfect for it. And what's great about hosting a run / brunch is that none of your guests expect you to do your hair and makeup! Hazzah! The only downside was that we didn't have enough furniture for everyone to sit. Sorry, guys. It's a new home. We'll get it furnished eventually! Maybe by next year's run! Thank you all for coming!